The State of Israel was established in 1947 when the UN passed a mandate that specified borders for Israeli and Palestinian states. Since 1948, Israel has fought several wars with neighboring Arab countries and occupied land outside the original borders with the most controversial being the land taken in 1967 from Jordan (the West Bank), Egypt (the Sinai Peninsula and the Gaza Strip) and Syria (the Golan Heights). 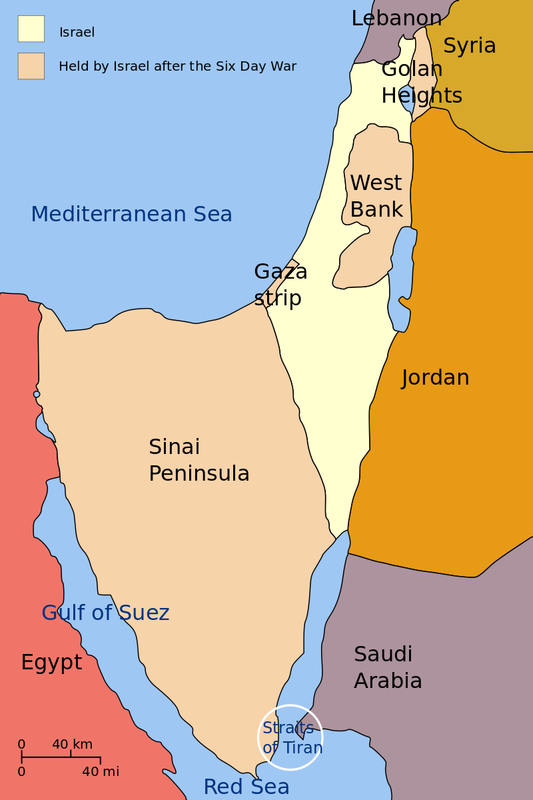 The Sinai Peninsula was returned to Egypt in 1982 and the Gaza Strip in 2005 (although some consider this area still occupied). The Golan Heights are still partially occupied by Israel with the UN occupying a buffer of land bordering Syria. The ongoing conflict concerns the West Bank, which continues to be occupied by Israel. In recent years, the members of the UN have worked to come up with a 2 state solution to the Israel-PLO conflict where both Israel and Palestine would be recognized – Israel on the land it was given in 1947 and Palestine on the land that Israel took in the 1967 war. In order for there to be a 2-state solution, Israel must stop building settlements in the Occupied Territory and give back the Western Bank it took in 1967. As more and more settlements are built in the Occupied Territory, the hopes for a 2-state solution diminish. There are those who say Israel has no intention of giving back the West Bank (more than 400,000 Israelis live in the settlements outside of Jerusalem) as evidenced by the recent announcement by Israeli lawmakers to introduce legislation to annex a Jewish settlement in the West Bank into Israel for the first time. Israel’s Prime Minister Netanyahu claims the PLO does not recognize Israel as a legitimate state but the PLO recognizes the right of the State of Israel to exist in peace and security and accepted the United Nations Security Council Resolutions 242 and 338 that called for the peaceful resolution of the Israeli-Arab conflict through territorial compromise. The acceptance of both resolutions indicates their recognition of Israel, although there are those who disagree. In addition, there have been numerous Letters of Recognition signed by the PLO acknowledging Israel’s right to exist in peace and security. An ultra conservative political group within the PLO called Hamas refuses to recognize Israel and is intent on destroying Israel although they are no match for Israel’s army or intelligence. On December 23, 2016, the UN Security Council passed a resolution condemning Israel for building settlements on land in the Occupied Territories on the West Bank. The US abstained from the vote although this action (abstaining versus vetoing) could be construed as a vote in favor of the resolution that passed 14-0. Unfortunately, many supporters of Israel often categorize people and governments as either a friend or an enemy of Israel – you’re either for Israel or against them with “for” meaning you have to support every one of Israel’s decisions. Criticize Israel and risk being called an anti-Semite or the wrath of those who can only think in simplistic terms of black and white and who don’t understand that friends can disagree (this is key). What Prime Minister Netanyahu and many supporters of Israel fail to understand is that so many of us – Catholics, Protestants, Atheists, Agnostics, Muslims, Buddhists, and more – recognize, respect and financially support the State of Israel but don’t support Israel’s occupation of the West Bank or the building of Jewish settlements on land outside of Israel’s borders. Over the past 10 years, the US government has given $38 billion in aid to Israel, an average of nearly $4 billion per year. For Prime Minister Netanyahu to say the US has abandoned Israel because the US abstained from voting on the UN Resolution regarding the building of settlements in occupied territory is preposterous. The US clearly recognizes and supports the state of Israel but doesn’t support Israel’s decision to build settlements on land that is not a part of Israel. There is a difference. The world wants a solution to the 50 years of conflict and that solution is vested in the establishment of a PLO state on the West Bank but Israel is not convinced. What would Israel do if the Palestinians invaded Israel and took a portion of its country, occupied it for 50 years with no intention of giving it back, and built Palestinian settlements on what was Israel’s land? They would fight for it so why does the Israeli government expect anything less from the Palestinians? But more importantly, why won’t Israel respect borders and the US Security’s unanimous vote to stop building settlements outside Israel’s borders? In today’s New York Times, on page 5 is a full page advertisement paid for by jstreet.org. (pro-Israel, pro-peace Americans who want Israel to be secure, democratic and the national home of the Jewish people) thanking President Obama and Secretary Kerry and applauding their courage in addressing the conflict in both practical and moral terms. To join jstreet in thanking Obama and Kerry for their leadership, go to jstreet.org/thankyou. ← The Big Why Questions for 2017….